Tonight in Texas in the seventh inning, Joe Mauer, our future MVP, hit his 25th home run of the year. The gentleman in the center of the picture, wearing the Vikings T-Shirt, threw the ball back. Now I understand wearing a Vikings T-Shirt, but I don't understand throwing back a ball from a player going to the Hall of Fame. 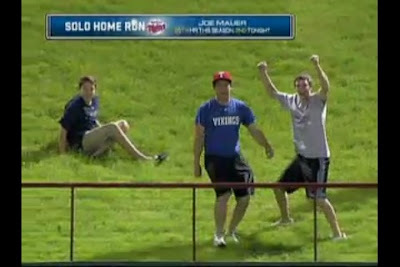 How many times are you going to get a home run ball, much less from a player of Mauer's character and skill. There is only one word for this, FAIL.